The crisis goes on, and so does DYNDY in its effort at proposing new effective landscapes for structurally counteracting the institutionalization of austerity. The goal is to set viable standards for beginning to live the future of money, in the present. During the past year, DYNDY has been critically active within Hacklabs, Social Centers and occupied theaters, alongside with international policy institutions like the United Nations, academic circles, the Complementary Currency Movement in Europe, South America and Africa, and the Bitcoin cluster of currencies. In Spring 2103, thanks to a hectic networking hacktivity, DYNDY finalized and then adjudicated funding from the European Commission for the research, design and implementation of two web applications, Freecoin and Threadgate. They will be the part of the output of a 7th Framework Program research project named Decentralized Citizens Engagement Technologies, the D-CENT project. As we are starting the core activities within D-CENT, we thought to gather and frame both academic and blogging production related to DYNDY. And as for the free-software spirit coding Dyne.org’s DNA, we are now offering that chaosmic order for free to you, the Commoners. After a selection of the best pieces that we have humbly put together to date and together with a most welcome contribution from Prof. Adam Arvidsson, the result is AC-Adaptor or Alternative Currency Adaptor, the DYNDY Reader for Digital Currency Design. True, the theoretical and political reflections emerged in more than three years of conferencing, networking and study had brought us to crossing the threshold with the real socio-economy. Designed around a ‘lean user experience’ methodology, D-CENT is a project that will create a virtual pan-European Collective Awareness Platform hosting tools for aggregate democratic decision-making to the benefit of social movements in Spain, Iceland and Finland. On top of the CAP, a second pilot on Social Digital Currencies will see Freecoin – a Bitcoin based client for customizing the genesis block in order to issue alternative and complementary digital currencies while adding tailor made modules conditioning the currency and communicating with the blockchain, and Threadgate – a geo-localised market place for the horizontal exchange of value among D-CENT users. 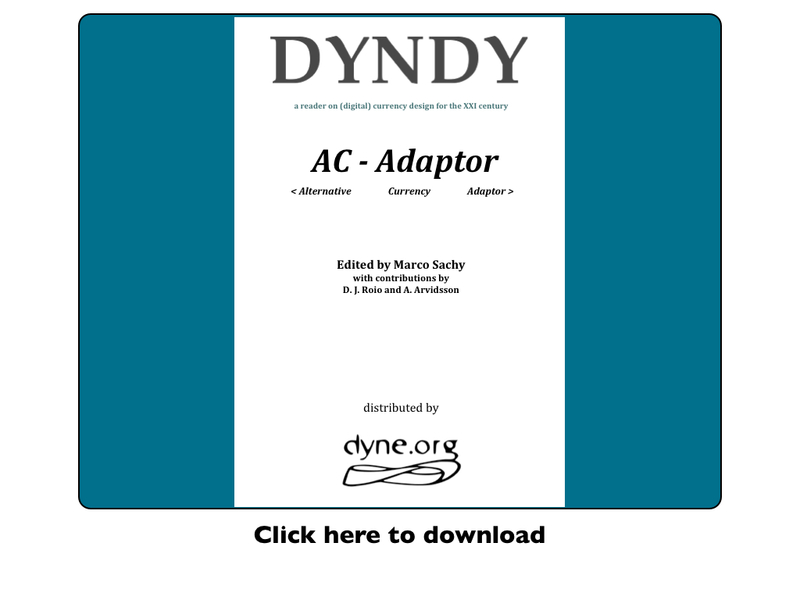 AC-Adaptor is both the end of the theoretical era of DYNDY and the beginning of the application and testing of DYNDY findings, belief systems and design principles together with socio-economic values and novel governance constituencies for making this a better place. Conscious that DYNDY does not have the solution to all money problems of this world in its pockets, we nevertheless continue to strive, self-reflect, put to trial and share what we consider to be the tools that will unavoidably replace the ones currently dominating monetary life and impairing our Freedom of Economic Interaction worldwide (only in this sense the global crisis is a desirable event). Through D-CENT, we are going to put in practice with energy our advocacy for an explicit participation of society at large – the Multitude – to the decisions that mostly affect individuals in Europe (and worldwide) today, ie user data protection and privacy at the service of P2P monetary transactions in transparent circuits of mutual trust. This is the first building block for avoiding by design the hubris of speculation and utility maximization at all costs (as for the core of single-currency thinking) in favor of a polidoxy in human-friendly money and payment systems design for the creation of a G/Local multi-currency system co-owned and co-managed by the users. Here the link to Dyne.org Download Zone, where the DYNDY Reader is parked in its version 0.8. We whereby invite DYNDY readers to share this and D-CENT partners to contribute to drafting a paperback version of this text edited by Radium for a D-CENT’s kickstart (sic! ).